Flowers left in tribute for the late Adrain Ismay on Hillsborough Drive off the Woodstock Road. The family of prison officer Adrian Ismay are said to be “bearing up as best they can” as the PSNI announced they are treating his death as murder. 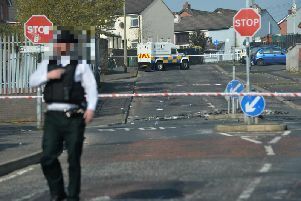 The 52-year-old died on Tuesday, 11 days after a republican bomb detonated under his van in Belfast. Last night a prominent dissident claimed his murder was linked to conditions in Maghaberry prison, and “could’ve been prevented”. Pressed on whether the bombing was morally wrong, Londonderry councillor Gary Donnelly said it was “regrettable”. Meanwhile, the head of the Prison Officers’ Association contrasted the conduct of his members with dissident republicans who “talk about their human rights being violated”, but believe murder is acceptable – and suggested such inmates should not be held in the prison system at all. Following Mr Ismay’s death on Tuesday (after he had been released from hospital and was believed to be recovering), a post-mortem examination was carried out to determine if his death could be linked to the bomb which injured him in east Belfast on March 4. The PSNI said yesterday afternoon: “Following the death of Adrian Ismay and subsequent post-mortem examination, detectives from Serious Crime Branch have today launched a murder investigation. Finlay Spratt, chairman of the Prison Officers’ Association in Northern Ireland, said he visited the 52-year-old’s wife and three daughters yesterday. He understands Mr Ismay suffered a heart attack and that he was taken to hospital, but that he could not be saved. It is understood his funeral is to be held at Woodstock Methodist Church in east Belfast, although its minister said that no firm details have yet been arrived at. Mr Spratt told the News Letter that Mr Ismay’s relatives are “devastated”. The Ismays themselves did not wish to speak directly. Mr Spratt – a long-serving prison officer, whose organisation represents about 1,350 staff – said: “I often wonder: Should we really be working with these people [dissidents]? Pressed on what he meant, he said he was not suggesting executing them. He was asked where he feels such prisoners should therefore be put; such as a military-run jail, for instance. He stressed that a decision on where they should go was not his to make. He said: “That’s not up to me to suggest. But they’re not complying with the prison system. They don’t want to operate like any other prisoners do. He noted that some of the entry level prison officers who look after such prisoners are getting salaries of about £18,000 for effectively risking their lives. Gary Donnelly, a member of the 32 County Sovereignty Movement, was elected as an independent republican councillor for Londonderry in 2014. A group called the New IRA had claimed the March 4 bombing. Rather, he said, it was linked to “the ongoing situation in Maghaberry prison” – which he claimed involved “protests and beatings and taking away people’s rights”. He said: “Any loss of human life is regrettable. He was asked if it was ethically wrong, rather than just regrettable. Mr Spratt meanwhile said that dissident republican prisoners’ idea of ill treatment is “they can’t get doing what they want to do”. He said last night: “They want to run their own landings – like they used to do in the Maze days. “I can assure you, it’s the opposite way around.